BOTOX® has been used therapeutically for more than 17 years to treat a variety of medical conditions. It is approved in mores than 75 countries and remains the most-studied botulinum toxin and one of the most researched medicines in the world. In 2002, the same formulation – in the label BOTOX® Cosmetic was approved by the US Food and Drug Administration (FDA) for treatment of moderate to severe frown lines between the brows in people ages 18 to 65.
Who is eligible for BOTOX®? For the most part, anyone wishing to improve their appearance by removing wrinkles and lines from their face is a good candidate for BOTOX®. Women who are pregnant or nursing are not recommended to receive BOTOX® treatments, and all candidates must be in good health overall in order to be a qualified candidate. The most common side effects following injection include temporary eyelid droop and nausea. Localized pain, infection, inflammation, tenderness, swelling, redness, and/or bleeding/bruising may be associated with the injection. 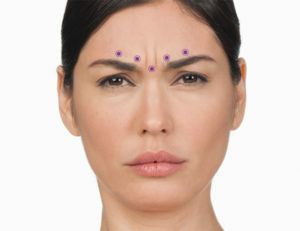 Patients may also experience headaches and other pain around the area of the face where the treatments occured. BOTOX® Cosmetic is a quick and minimally invasive procedure consisting of a few tiny injections. Your doctor will determine exactly where to administer these injections to achieve the best results for you. No anesthesia is required, though he or she may choose to numb the area with a cold pack or anesthetic cream prior to injecting. The entire procedure takes approximately 10 minutes, and there is no downtime afterward. Discomfort is minimal and brief. Localized pain, infection, inflammation, tenderness, swelling, redness, and/or bleeding/swelling may be associated with the injection. You can expect to see results within days after your treatment, and the appearance of the area between your brows may continue to improve for up to a week. Your own results may vary – be sure to talk to your doctor about what you can expect.